Join us for an unforgettable 12 Day safari where we explore the best that Malawi and South Luangwa has to offer. Malawi‘s breathtaking scenery, friendly people and incredible wildlife and birding makes it one of the top African destinations for any wildlife enthusiast. South Luangwa National Park in eastern Zambia, is a world-renowned wildlife haven which supports large populations of game such as Lion, Wild dog, Elephant, Buffalo, Hippo, Thornicroft’s Giraffe, Zebra, Wildebeest, Impala and Baboons. The birdlife in this park is also prolific with over 400 recorded species in the park. After your arrival at Lilongwe International Airport you will be transferred to Liwonde National Park, where you will spend the next 3 nights at Mvuu Lodge. Mvuu Lodge nestles discreetly on the banks of a lagoon just off the Shire River on the western boundary of the wildlife-rich Liwonde National Park. Liwonde National Park straddles the beautiful Shire River and its floodplains. The park harbours an abundant wildlife population: large numbers of elephant, reedbuck, waterbuck and sable, with a dense population of hippo in the river. Buffalo, Lichtenstein’s Hartebeest, Zebra, Roan, Eland. The birdlife is prolific – over 400 of the country’s 650 bird species occur in the Park. Activities include: Game drives, Night drives, Nature walks, Birding and River Safaris. An early morning departure for your transfer to Nyika National Park where you will spend the next 3 nights at Chelinda Lodge. Chelinda Lodge offers a luxurious highland experience in Nyika’s rolling grasslands, which are often dotted with large herds of Roan, Eland and Zebra. A pocket of Hagenia woodland and forest backdrop perfectly shelters this idyllic upland lodge. Nyika National Park harbours important populations of Roan, Eland, Crawshay’s Zebra, Southern Reedbuck, Bushbuck, Warthog, Spotted Hyaena and Side-striped Jackal. Elephant are occasionally spotted, with Leopard often seen in the daytime owing to the temperate climate. Activities include: Game drives, Night drives, Nature Walks, Mountain Biking, Birding. Today we will transfer to Mfuwe, where we will spend the next 2 nights at Mfuwe Lodge. Mfuwe Lodge is nestled beneath a canopy of ebony and mahogany.This region of the park is renowned for its prolific game – Giraffe, Hippos, Buffalo, Antelope, and Crocodile are constant visitors to Mfuwe Lodge’s lagoon. The majority of outings are game drives, allowing you to explore as much of this prolific region of the Luangwa Valley as possible. We will transfer to a South Luangwa bushcamp for the next 3 nights. Each of the bushcamps is set in glorious surroundings. We will use the next three days to explore South Luangwa National Park with a combination of game drives and guided walks. South Luangwa is known as the park where the guided walking safaris originated. 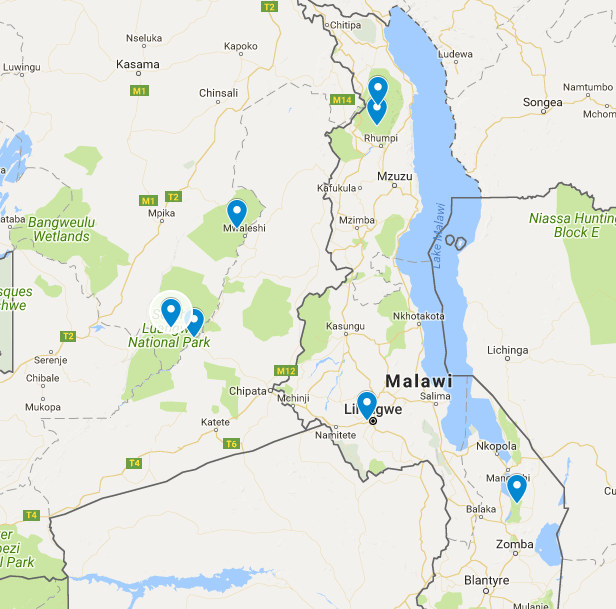 You will be transferred to Lilongwe for your flight back home or contact us for possible extensions to Lake Malawi.